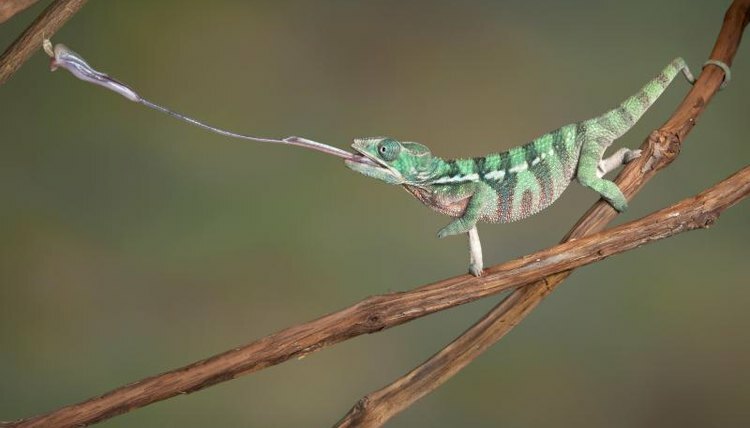 Chameleons use long sticky tongues to grasp their insect prey. This can be fun to watch, and allows novel feeding strategies that are not applicable for most other lizards. In addition to releasing insects directly into the cage -- as is done with most captive lizards, you can feed your chameleon by hand or with a feeding cup. If you keep your chameleon in a cage made of glass, plastic or fine mesh, you can simply release feeder insects directly into the cage. Do not introduce more insects into the cage than your lizard can eat in one sitting; excess insects may chew on your chameleon while he is sleeping. Remove any insects that are still in the cage after one hour. If you are patient, you can feed your chameleon his insects individually. Using your fingers, tweezers or forceps, hold a cricket, moth, mealworm or silkworm out in front of your lizard’s face. Your lizard may be reticent to accept items offered in this manner at first; remain still and don’t look directly at the lizard while trying to entice him to eat. By using a feeding cup, you can contain the feeder insects to one area of the cage. This allows you to provide numerous feeder insects that your chameleon can eat at his leisure, but the insects cannot harm your lizard since they're trapped in the cup. Attach a plastic or wax paper feeding cup to one of your chameleon’s favorite perches. Use a cup that is smooth enough to prevent the insects from crawling out.